The Nineteenth Judicial District Commission on Judicial Performance unanimously recommends by a vote of 10-0 that Judge Timothy G. Kerns BE RETAINED. 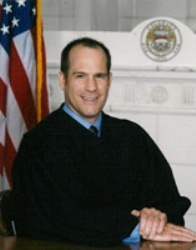 Judge Kerns was appointed to the Weld County Court in October of 2007 then to the District Court Bench on January 1, 2011. Before taking the bench he worked as general counsel for a title company in Missouri. He moved to Colorado in 1995 working in private practice with a focus on domestic relations, dependency and neglect, mediation and civil matters in Fort Morgan, Erie, and Boulder. He was a partner in with the law firm of Crespin, Kerns & Furman, L.L.C. and Furman, Kerns & Bauer L.L.C. from 1996 until 2007. The Commission conducted a personal interview, reviewed opinions he authored, observed him in court, and reviewed surveys completed by attorneys and non-attorneys. In answer to the question “how strongly do you recommend that Judge Kerns be retained or not retained,” 78% of the attorneys recommended retention, 10% recommended not to retain, and 12% made no recommendation. Of the non-attorneys responding, 94% recommended to retain, 1% recommended not to retain, and 5% made no recommendation. Judge Kerns’ docket is District Court criminal cases. He also presides over the drug court. The overall combined survey results show Judge Kerns scored above the average for all District Court Judges standing for retention. This was also true for the attorney surveys which graded Judge Kerns higher than the average for all District Court Judges standing for retention. Of the non-attorney surveys, Judge Kerns received an overall grade above the average grade for all District Court Judges standing for retention. He was graded above average in several areas on the surveys from both attorneys and non-attorneys. These areas include communication, demeanor and neutrality. Members of the Commission were impressed with his involvement and concern for the community.